On 10 February 2012, two war-correspondent Marie Colvin and photographer Paul Conroy entered war-ravaged Syria to cover the plight of civilians trapped in besieged Homs, under attack by the Syrian army. Only one of them returned. 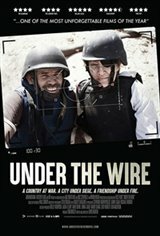 Based on Conroy's book Under the Wire, the film is a gripping account of the triumph of the human spirit in the face of overwhelming adversity.